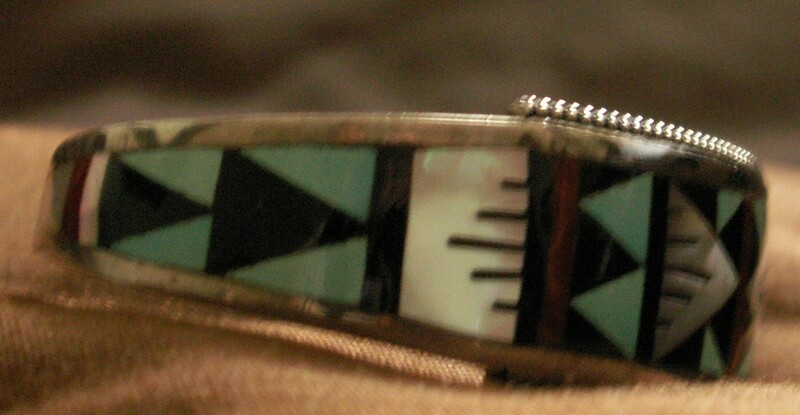 Inlay Bracelet by Navajo artist Merle House, Jr. I just had to have it…………it matched a pendant and ring I have by him which I love to wear. BUT the bracelet was gallons too big. Made to fit a 7 1/2″ wrist, I didn’t know if it could be closed up enough to fit my 6 3/4″ wrist. BEFORE – The 1 3/4″ gap was so large that the bracelet would roll and fall off my wrist. The silver measured 5 3/4″ end to end. It was the gap that was the bad boy – at 1 3/4″ it would allow the bracelet to roll and fall off my wrist. If it could be closed at least 1/2″, down to a 1 1/4″ gap maximum, I think that could work for me – still enough of a gap to get on and off but it would stay on. It would likely be a little lose but for these big heavy ones, I kind of like them moving a bit. AFTER – Here it is after resizing – With the gap closed to 1 1/8″, the bracelet now goes on and off very easily and stays put on my wrist ! “It’s a commonly held belief that inlaid bracelets cannot be sized because of the risk of stones popping out or breaking. It can, however, be done by a skilled silversmith with the right tools, materials and experience. The simplest style to resize have stones inlaid on less than half of the length of the bracelet (like Paula’s). The inlay is confined to just the front of the bracelet – that was good news for getting this resized downward. Special tools and a lot of patience will allow the silversmith to bend only the sections of bracelet that have no stones. The inlaid portion will not change its shape, and the stones will remain secure. If more than half of the length is covered with stones, the silversmith can lift the stones out of the bracelet, reshape the bracelet, and then carefully set the stones back in place. There are a few adjustments to be made, however, as the “bed” for the stones will now be a different size. If the bracelet is being made smaller, the curved bed will become longer – then tiny slivers of stone will be added to fill the gaps. More difficult is if the bracelet is being made larger – the curved bed becomes shorter so some of the stones will be filed ever so slightly to fit correctly without binding. So here it is back to me and WOW, my dream came true. Many thanks to Diane and Henry for yet another successful jewelry modification/repair ! Over time coral is replaced by agate, which cuts easily and takes a high polish. The fossilized coral stone shows small flowers on and within the stone. Colors range from cream to caramel to deep brown, various shades of gray, black, white and occasionally red. Fossilized coral is used in Native American inlay bracelets, most notably Navajo. Here are a few examples.